“What’s your idea of heaven?” asked Zac, turning to Miles as they prepared for the mission that they both knew could make or break their military careers. Zac joked that their Muslim targets thought heaven was “seventy two virgins and all the kebabs they can eat” but what is heaven to a British soldier?. It’s a question that comes back to us as the tale progresses. Will we ever find out or are we destined to spend the next 286 pages of Patrick Bishop’s second novel getting much more familiar with the soldier’s idea of hell? The place is Afghanistan – Helmand province to be precise. The time is…..well I guess sometime right round about now. Certainly it’s a time after the initial gloss of combat has worn off; when the days when the men feared conflict in Afghanistan might be dull and lacking in proper fighting lay far in the past. Even in the drudgery of conflict there are times when good men get the chance to shine and Zac and Miles are preparing for that time, laying in wait for their moment to capture a ‘high-value target’. The problem is that you can take the man out of England but you can’t take the Englishman and his ideas of chivalry out of soldier. Their target turns up but he’s not alone – there’s a camera crew and a burka-clad woman whose death looks set to be the focus of the filming. All goes pear-shaped – the men rescue the girl, the high-value target gets away and men are killed on both sides. The soldiers find their group reduced in numbers with respect to military men but swelled with two additional headcount – Ghazala, the young woman, and a young Talib who turns out to be from Birmingham. When their helicopter pick up goes badly wrong, the group are left to make their way back to base, 50 km away through unfriendly territory, unsure who to trust and who to fear. It’s like Disney’s ‘The Incredible Journey’ but without the cat and dogs. It’s a well tried and well worn route – but none the worse for its familiarity. You can probably guess a lot of what will happen as there are relatively few twists or turns. The good side to that though is that it makes the book more believable. Will the group all make it back to base? If not who will be lost and how? Why was Ghazala going to be killed and who will the Brummie-Talib support when the chips are down? Follow me Home has been heralded as “The First Great Novel of the Afghan War” and I’m surprised to find out that despite years of conflict, few fictional books have been set in contemporary Afghanistan. I’ve read a lot of books set in this troubled country and have joked that the shelf marked ‘happy books about Afghanistan’ is probably the emptiest of all in the virtual library. When set against the misery-lit that typifies books about Afghanistan, Follow Me Home is one of the easiest and lightest reads in my collection which I’m sure is not what the author intended. It’s all relative, I suppose and Follow Me Home is rather more uplifting than I expected. To be fair to the author I have to say that I really don’t read war stories. I’ve never touched an Andy McNab and I tend – in rather girlie fashion – to just find war rather confusing. I can’t help thinking they should all sit down with a cup of tea and sort out their differences so I probably wasn’t ever the reader that Patrick Bishop had in mind when he wrote this. That makes it all the more remarkable that I rather enjoyed this book and I didn’t struggle to follow the story of Follow Me Home. I pretty much forgot it was a war story and saw it instead as the story of a journey from danger back to safety, from the unknown back to the known and perhaps what Zac might have considered from Hell back to Heaven. Throw in a couple of cute animals and it’s be absolutely perfect. 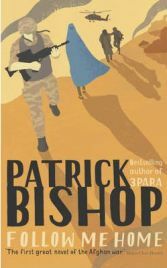 Patrick Bishop undoubtedly knows his stuff after working as a foreign correspondent for two and a half decades, following the British Army on deployment. You can’t make this stuff up and it shows. We get the balance of excitement, fear, exhilaration, despair, pain, boredom and restlessness which resonate with authenticity. I hope the Armed Forces won’t be offended if I say that soldiers don’t make the most elegant writers but writers who don’t have the personal experience of war struggle to produce something authentic. Bishop therefore offers the perfect combination of real field experience with journalistic flair. It works better than I expected it to do. I don’t think I’m going to switch away from my usual genres and read more war books but I was surprised at how interesting I found this and how easy it was to read. I was sucked into the story and cared about the characters and what happened to them and I was also grateful that Bishop wasn’t tempted to provide the cheesy happy ending that many lesser writers might have chosen. With thanks to the publishers Hodder and Stoughton for providing a review copy. No Comments on "Follow Me Home"